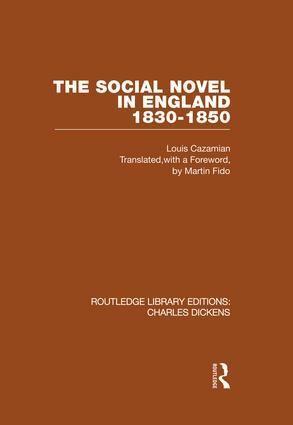 This is the first English translation of Le Roman social en Angleterre by Louis Cazamian, which is widely recognized as the classic survey of Victorian social fiction. Starting from the eighteenth century, Cazamian traces the ways in which rationalism and romanticism intertwined and competed, particularly in relation to radical political philosophy. He shows how industrialization polarized England, setting the industrial bourgeoisie in the van of progress in the first decades of the nineteenth century, until their political and economic triumph stirred up a passionate reaction against them. This reaction propelled novelists such as Charles Dickens who lies at the centre of his discussion. For this translation Martin Fido has provided a substantial foreword, and has revised and completed the bibliographical references and corrected the footnotes to assist the present-day reader.